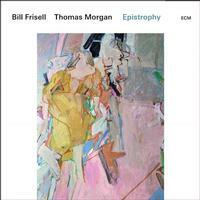 In recent years, bassist Thomas Morgan has performed widely with guitar legend Bill Frisell in trio, quartet, and quintet formats, but it is in their duets that their extraordinary musical rapport is experienced at its most intimate and conversational. Their 2019 release Epistrophy, was recorded live at the Village Vanguard. Bill Frisell's career as a guitarist and composer has spanned more than 40 years and many celebrated recordings, whose catalog has been cited by Downbeat as "the best recorded output of the decade." Thomas Morgan is a double bass player with a unique approach to the instrument and an exceptional musical understanding. He has played on more than 90 recordings and toured all over the world as a member of bands led by Bill Frisell, Jakob Bro, Jim Black, Dan Weiss, Craig Taborn, Paul Motian, John Abercrombie, Dave Binney, Steve Coleman, and Tomasz Stanko, among many others.